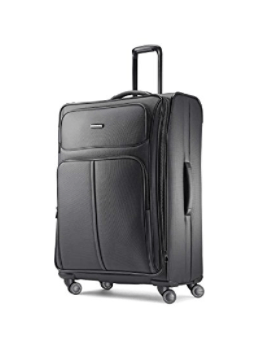 Samsonite Leverage LTE (91999) is a large 29-inch size spinner type suitcase with a sturdy nylon exterior, a stylish design, and functionality for the modern day business travelers. You have three color options of purple, charcoal, and Poseidon blue with more or less similar price tags. The 29” Samsonite Leverage LTE weighs 10.5 pounds and measures 29 x 20.25 x 11 inches, and has a 6459 cubic inches of capacity. By unzipping the main zipper all the way around you will have an extra storage capacity of around 1.5 inches. It needs to be checked in at the counter at the airport. 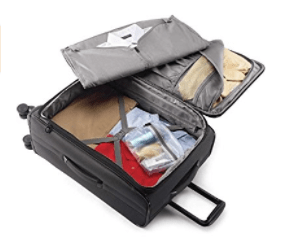 You will find a convenient detachable zippered suiter inside that is not really common to most other suitcase models and that will come in handy especially if you are a business traveler. There are compression cross straps on the main side of the bag interior that will help keep your clothing and other stuff in place and not shift when the bag is held vertically or thrown around by airport staff. This suitcase has a reliable design, doesn’t have a hardshell exterior but a great quality solid and durable 400D X 360D nylon one with a coating that is weather, puncture, tear and abrasion resistant. It includes guards in the corners that protect against any potential wear and tear and the bag is impact resistant with a sturdy and durable exterior overall and great quality internal components. It has a total of eight wheels- four redesigned and lightweight, smooth rolling double spinner wheels that move in all directions effortlessly. The bag is easy to maneuver from back to front or left to right and you can move it easily on the airport terminal or parking grounds. You have the padded handles on the side and the top for easy lifting as well as a locking telescoping handle for no strain on your arms. Samsonite has more than hundred years of history and is one of the best-known brands and a global leader in the industry- luggage, travel bags, and accessories, for quality, durability, design, and style. And as a proof of such high-quality construction, the Leverage LTE comes with a limited warranty of ten years by Samsonite. It is designed for those frequent business travelers that need storage capacity, functionality, and durability. It is spacious inside- has a large capacity, is very well constructed and a very good quality bag, has different self-repairing coil zippered exterior and interior mesh, wet and zippered compartments for different items- your shoes, clothes, toiletries, accessories, and documents like your passport and ID card. The Samsonite Leverage LTE is a bag that will withstand the pressures of tens of flights per year but can also be used by leisure travelers. 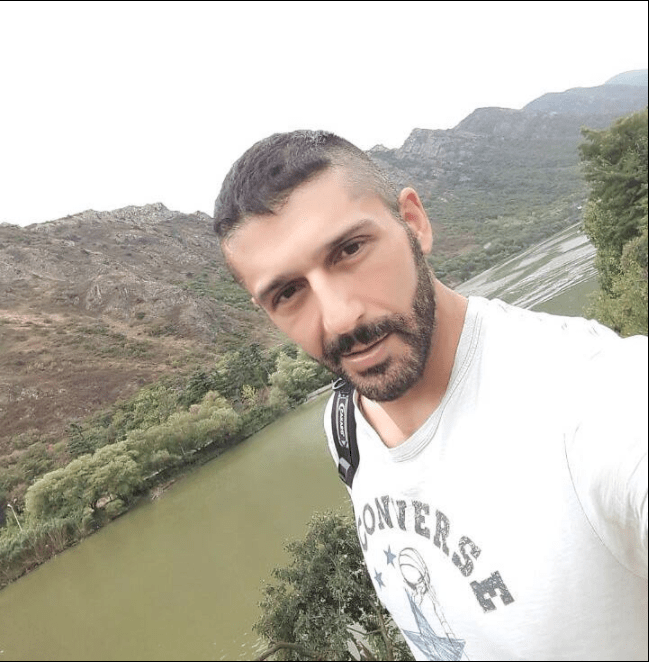 admin on What’s Uskudar- the Asian Side of Istanbul Like? 2019 Coldturkeynow.com. All rights reserved. Coldturkeynow.com is a participant in the Amazon Services LLC Associates Program, an affiliate advertising program designed to provide a means for sites to earn advertising fees by advertising and linking to Amazon.com. Cold Turkey Now © 2019. All Rights Reserved.